Use floral fabrics or bright colors to piece together a tulip garden to spruce up a wall. 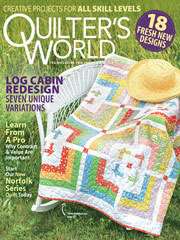 This e-pattern was originally published in the Spring 2015 issue of Quilter's World magazine. Size: 42" x 32". Block Size: 6" x 8", finished.